What is Camu Camu Extract? Why Take Camu Camu Extract? 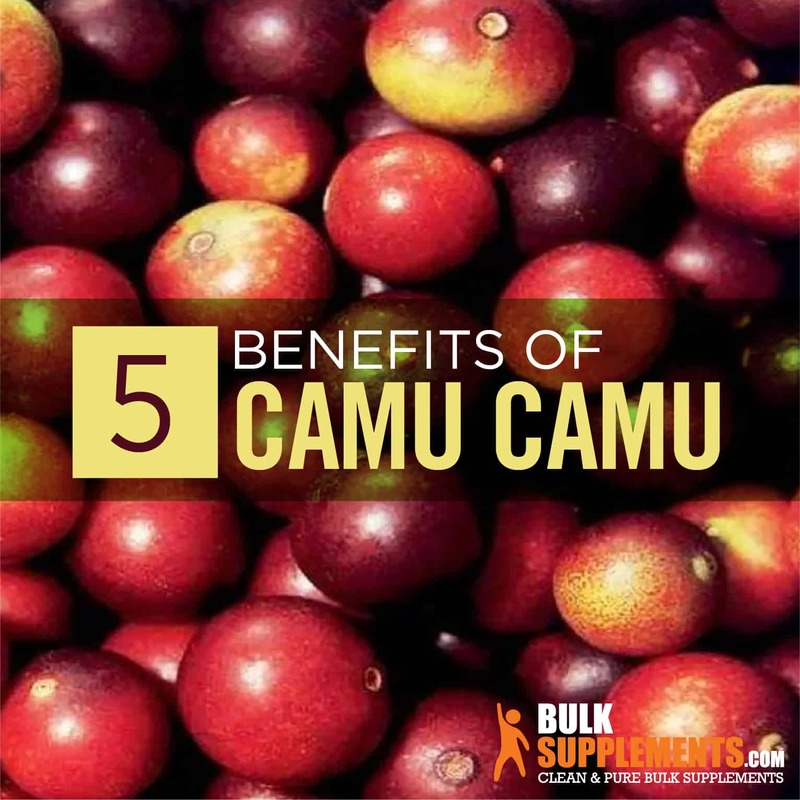 Camu camu is a small berry that grows on shrubs in the Amazon rain forest. Think of a large cherry if you want to get a good idea of its size. Most notably, the camu camu fruit is known for its antioxidant capacity and anti-viral properties. The standout antioxidant that most people associate with this superfood is vitamin C. Needless to say, if you are looking for a boost in your vitamin C intake and other valuable antioxidants, camu camu is definitely something to think about (x). The actual camu camu fruit itself has a very tart taste. It’s also very high in acidity. Eating it straight is not the most enjoyable thing in the world. For this reason, it is usually consumed in the form of juices, purees, pulp or powder (x). Most notably, powder is usually the most popular form. Fortunately, camu camu is much more enjoyable in this form than it is in its natural state. All that said, how else can camu camu extract benefit you? Camu camu is gaining in popularity as a superfood due to its high levels of vitamin C and antioxidants. In fact, you can get up to 30 times more vitamin C out of it than you will with an orange (x). More and more people today are looking for good, natural ways to add it into their diets, and camu camu looks to be the answer to this problem. Vitamin C is especially useful when it comes to immune system support (particularly when you are fighting a cold). Those who take vitamin C on a regular basis will often see that illnesses do not stick around as long as normal. You are also likely to have less severe symptoms (x). Some studies have also suggested that those with higher levels of vitamin C in their diets have a lower risk of developing cataracts (x). Though vitamin C is the main attraction, what other antioxidants does camu camu provide? Well, it also has anti-inflammatory properties. Particularly, this could be an effective tool when treating disorders like arthritis and gout (x). For those who deal with high blood pressure, camu camu brings some benefits in this department as well. It has been linked to lower blood pressure levels after consumption. While this topic is still something that requires further studies to properly define the exact correlation between the camu camu and blood pressure, the early data on this benefit looks promising (x). Even with all of the good things it does for the inside of your body, it can also provide some healthy benefits on the outside as well. It all stems back to those high levels of vitamin C, which protects the skin from oxidative stress by donating electrons to neutralize free radicals (x). In other words, it can help give you clearer and younger-looking skin. On top of this, camu camu will also help protect against UV rays. The antioxidants help neutralize the reactive oxygen species (ROS) that forms due to UV exposure (x). Though camu camu powder cannot be dubbed as the savior to killing cancer, it does have antioxidants that have been shown to kill cancer cells. These antioxidants are called withanolides. Withanolides are steroidal lactones built on an intact or rearranged ergostane skeleton that have been shown to exhibit antiprofliferative activity on various types of cancer cells (x). In other words, it helps fight off cancer cells! With so many harmful foods and beverages out there linked to cancer, it’s nice to hear about one that fights it off! Trying to enhance your athletic performance? This could help. We all know that if you want to improve your physical performance — whether it be running, sports, weight lifting or any physical hobby — you need energy! Just think about the last time you tried to work out or do something physical when your body was fatigued. It’s just not easy! Now think about this; your body’s energy often aligns with your mood. Fortunately, an increase in the intake of vitamin C has been linked to improving the mood of those who feel fatigue or depressed. While there is still ongoing research on this subject, many studies have shown vitamin C is a major contributing factor to mood-elevating effects (x). As with anything that you put into your body, there are some side effects that can potentially impact you. Too much of anything is not good for you, and camu camu is no different. In this instance, it’s the intake of vitamin C that we want to note. Exceeding the upper limit of the recommended daily intake of vitamin C can bring on some side effects. Every person is different when it comes to what side effects may or may not occur. However, it’s still important to be aware of these potential side effects before you consume camu camu extract powder. Most of these side effects occur when you take higher amounts of the recommended dosages that are listed on the product package. Getting back to vitamin C, the recommended daily amount of vitamin C for adults is 65 to 90 mg a day. The upper limit is 2,000 mg a day. Taking larger amounts of vitamin C can cause diarrhea, nausea, vomiting, heartburn, abdominal cramps, headache and insomnia. Again, you generally will not experience these side effects if you do not exceed the upper limit of 2,000 mg of vitamin C a day (x). Do not take this supplement if you are nursing or pregnant, or if you have a history of kidney problems. Stop taking immediately and seek medical attention if these side effects worsen or persist. If you are undergoing chemotherapy, please consult with your doctor before taking camu camu extract. Some studies have shown concern that high levels of vitamin C may lessen the effect of chemotherapy (x). Moderation is key for any supplement. For this reason, do not take more than what is instructed on the product label. As a dietary supplement, you should take 2,500 mg (scant 1 tsp) 1 to 2 times daily, or as directed by a physician. As with all supplements meant to promote general well-being, it is important to note that a supplement such as this is by no means a substitute for legitimate medical advice. It is always best to talk to a doctor if you are experiencing problems with your health before taking any supplements. Most people are drawn to camu camu because of the high amounts of vitamin C. This in itself is a great reason to supplement with it. You are boosting your immune system while simultaneously receiving numerous other benefits. And for those who struggle to incorporate vitamin C into their everyday diets, camu camu should be at the top of your list to consider taking. In addition to its many health benefits, camu camu powder is an organic food supplement. You don’t have to worry about it being packed with additional fillers that aren’t good for you. Creating and maintaining a diet that you can feel good about can be a challenge. With camu camu, though, you can feel good about it. Start out by mixing it in with something sweet, like a smoothie or juice. Another good option is yogurt, especially a sweet flavor like a mixed berry. If these don’t work for you, consider trying it with another food option, such as oatmeal. You can mix in milk, fruits and nuts to create a sweet taste that will go well with the camu camu powder. Sometimes, it simply takes some trial and error with different food and drink combinations until you come up with something that works best for you. Once you get the combination right, it’ll be worth it. There are numerous benefits that this little Amazonian fruit provides. Antioxidants are aplenty with the camu camu fruit. From high levels of vitamin C to anti-inflammatory properties, this organic food-supplement can benefit your body in many ways. It also links to a lower blood pressure, mood-elevating effects (which aids your physical performance) and cancer cell-killing antioxidants. Moreover, it may even benefit your eyes and skin while increasing the immune system’s efficiency. Camu camu powder is a natural product that has no added sugars or fillers. This super fruit has plenty of its own natural antioxidants to benefit you all on its own. With so many benefits attached to camu camu, this is certainly a worthy supplement to consider.